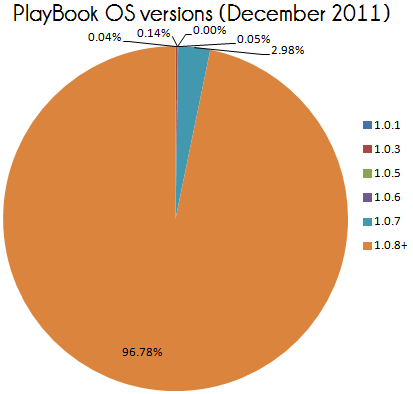 The above chart shows the breakdown (as of last month) of PlayBook OS versions currently in use. As was the case in September, the vast majority of users are running the latest OS. Because I feel that it is unreasonable to expect end users to be running a beta version of the software, users of OS 2.0 (and other unreleased versions) were included in the group of OS 1.0.8 users. The percent of people running the beta was in the low single digits. Data comes from December 2011 downloads of the free strategy game Pixelated.